For some, crafting isn’t so much of a hobby as it is a way of life. Whether you need to reorganize your craft room for professional or pastime purposes, we’ve rounded up a few of the best veteran tips below for transforming your space into an organized craft haven. 11. A DIY TO REFRESH OLD STORAGE CONTAINERS. Packing away some of your less-used gadgets doesn’t have to be boring. Make your craft room storage containers easier on the eyes by covering up bland surfaces with playful contact paper. Check out this simple tutorial from Homey Oh My for some stylish storage inspiration! 22. SORT RIBBON AND TAPE WITH AN OLD SPOOL RACK. One seamstress’s trash is another crafter’s treasure—get your hands on an old spool rack to effortlessly organize things like ribbon and tape. Take a peek at how A Night Owl sorted her washi tape with style. 33. 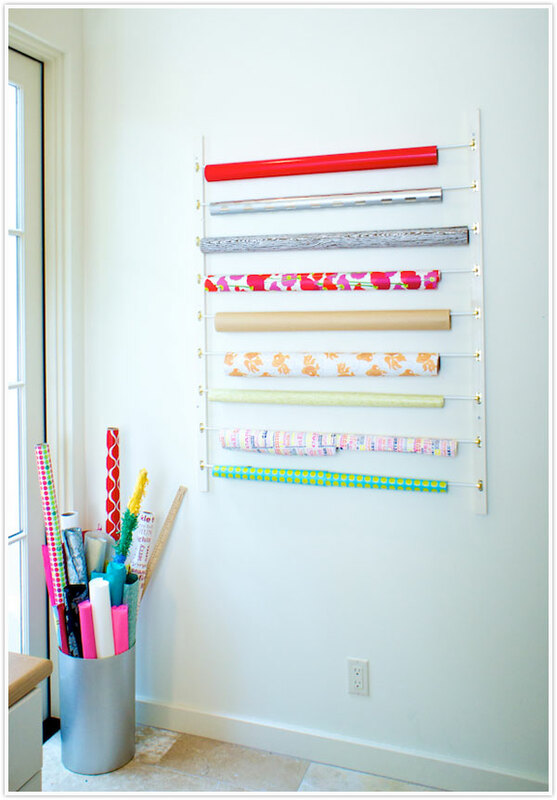 INSTALL A DIY WALL-MOUNTED WRAPPING PAPER ORGANIZER. Bring order to your heaping pile of wrapping paper with this DIY wall-mounted wrapping paper organizer tutorial from Camille Styles. Having all of your gift wrap fixed vertically in plain sight is a quick solution for freeing up some closet space in the craft room. 44. PUT FABRIC ON MULTI-WRUNG HANGERS. Instead of digging through drawers or bottomless plastic tubs to find that “one” fabric swatch you need for a project, drape your extra fabric at eye-level by using multi-wrung hangers. You’ll love how neatly IHeart Organizing displays the fabric in her closet. 55. UTILIZE BOTH SIDES OF THE SHELF. This thrifty hack from Good Housekeeping is one of our favorite craft room ideas for saving desk and counter space. Round up a couple of spare glass jars and secure them to the underside of a shelf or cabinet to hold all of your odds and ends. 66. KEEP CALM AND CART ON. If you’re on the hunt for a multi-purpose piece of craft room furniture, a portable storage cart is the perfect fix. Fill the shelves with a wide array of supplies, or designate it to one hobby, like Life Made Creations did here with scrapbooking materials. 77. DECLUTTER YARN PILES WITH A WINE RACK. Ditch the baskets of tangled yarn and keep your stock neatly tucked away within a wine rack. Group the yarn in a way that will be easiest for you to work with, like this handy color coded system done by Repeat Crafter Me. 88. ADD COLOR TO YOUR FLOORS WITH A DIY WOVEN RUG. Looking for a way to add some color to your craft room that doesn’t involve the remnants of glitter and glue? Spice it up with a homemade statement rug to help keep messy projects off of the floor and onto their designated work surfaces more regularly. For tips from a pro, take a look at this clever DIY Woven Rug tutorial made by A Beautiful Mess. 99. DISPLAY PROJECT SUPPLIES WITH A DIY PEG BOARD. Need a catch-all system to arrange miscellaneous and go-to project supplies? Tidy up stray materials by compartmentalizing them onto a peg board, like Honeybear Lane did here. Using a peg board will not only keep everything organized, but it will also ensure that all of your favorite tools are always within reach. 1010. DIY MAGAZINE FILE BOX. Before throwing out those empty cereal boxes, check out this DIY magazine file box tutorial by Vanilla Craft Blog. With some scrap paper and a few stamps, you can neatly organize stacks of magazines and tear sheets into trendy storage boxes for cheap! Do you have any noteworthy craft room hacks that we missed? Tell us about them in the comments!